This limited edition hand-customized EVH 5150III® 100S head is identical to the setup Eddie Van Halen has recently toured with, and features the exact same custom modifications. 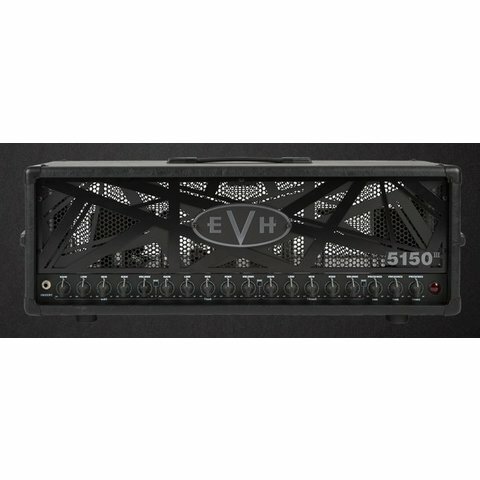 The 100-watt head features a single input and three channels (clean, crunch, lead), each with versatile controls (volume, gain, presence, low, mid, high). Channel two features increased gain for greater sustain and is re-voiced for improved low-mid frequency definition; channel three also features increased gain and improved range for the “low” control. Further, each channel has a rear-panel resonance control knob that dials in fine-tuned low-end response. The amp boasts eight JJ ECC83 preamp tubes, four Shuguang 6L6 power tubes, switchable output impedance (4, 8 and 16 ohms) and adjustable bias control. Other features include vintage-style “chicken head” control knobs, red jewel, dual speaker jacks, effects loop, direct out and molded plastic handle.